If ever two happy people wanted a family, it was Linda and Ty Power. After two tragic disappointments, Linda began to ask, "What's wrong with me?" Here is the answer. 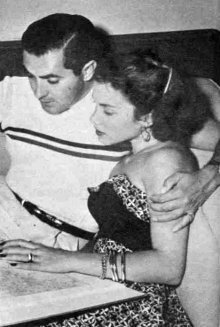 Linda and Tyrone Power were checking the time and deciding that they would have to hurry in order to keep their dinner date at Romanoff's with Mr. and Mrs. Henry Hathaway and Mr. and Mrs. Louis Jourdan. The date was October 1, and the time was 7:30 p.m.
Linda sat down to buckle her slippers, straightened suddenly and regarded her husband with wide eyes. "Do you feel all right?" Tyrone asked solicitously. "In a way, yes," Linda said. "In a way, no." She thought it over. "I don't think we shall have dinner at Romanoff's tonight. Perhaps you should telephone the Hathaways and explain. Tyrone rushed to the telephone, scattering cuff links and shirt studs in every direction. "Stay where you are," he ordered Linda over his shoulder. "Don't be nervous and don't get excited. Just be careful." He was back forty seconds later. Not only had he telephoned the Hathaways, but the doctor as well. The doctor said he would have a much longer run to the hospital than the would, as he had to drive all the way from the San Fernando Valley to Cedars of Lebanon Hospital. "However, don't worry about the stork arriving ahead of me. I'm sure the old bird isn't rushing his trip as determinedly as you seem to think." Tyrone relayed this reassuring news to his wife. "That's what he thinks," she scoffed. However, her forehead was furrowed by another problem. "I'm hungry. I'm so hungry I can't leave this house until I have something to eat." "I'm hungry, too, but this is no time to worry about food." Linda considered all things carefully before she said, "Well, I'm not going to that hospital until I've had a sandwich. Heaven knows when they'll want to give me something to eat." So they descended to the kitchen and raided the ice box. Luckily, there was cold sliced chicken, fresh white bread and plenty of milk. Linda ate one sandwich in record time and started on a second, but Ty paused in the midst of his fifth bite to say, "I think I'll eat this in the car as I drive along. I'm too nervous to stand here in the kitchen . . . ."
They set out cautiously, deliberately, avoiding the chuckholes and construction areas characteristic of the streets between Bel Air and Los Angeles. Although she had other things to think about, Linda noted in a hazy way that they appeared to be far South of the district in which she had imagined the hospital was situated. Originally, she and Tyrone had planned to make a trial run to the hospital during the week before the baby's scheduled debut around November 1st; no one had dreamed that the infant would eager-beaver into the world a month early. Linda recalled that the doctor had suggested they drive East on Sunset Boulevard. "You will be able to see the hospital from the street. "You can't miss it," he had said. "Isn't this Wilshire Boulevard?" Linda inquired. "Absolutely. You just relax. We'll reach the hospital in about five more minutes," said Tyrone with mock-heartiness. "Gosh, I believe I'm aiming for the Good Samaritan, but I'm supposed to be taking you to Cedars of Lebanon," he gasped. He swung into the next corner service station and secured precise directions. By this time, a little trickle of perspiration had descended from his forehead to a channel in front of his ear and from there had dripped onto his collar. His color was approximately that of a day-old bruise. "Are you all right?" he asked Linda. The stork was still flapping his wings in the far distance when Ty drew up to the ambulance entrance at the Cedars. The doctor was pacing the corridor beside the receiving desk. His practiced eye took in Linda's state of health at a glance, and ten minutes later she was tucked into bed, sound asleep under a sedative. Tyrone took up vigil in that celebrated little room with its well-worn rug and slightly worn leather chairs. He looked at his watch, lit a cigarette, picked up a magazine and looked at his watch. No it hadn't stopped. At eight a.m., the following morning, he was still doing much the same thing. The stork was sitting on Cloud 13, somewhere in the stratosphere, presumably looking at his watch, smoking cigarettes and fumbling through magazines. Tyrone couldn't wait. He hopped into his car and drove to the old house from which he and Linda were moving to the Bel Air Hotel until the new home they had just purchased could be redecorated. The movers were due with trucks, barrels, pads and dollies at eight, October 2. The original plan had presumed that Linda and Tyrone, together, would be able to organize the household transfer before the new Power joined them. That's the trouble with babies: they aren't accustomed to keeping appointments and they can't tell time. Tyrone did the best he could with the moving, but confusion was not to be denied; at latest count, one-third of his clothing was still at the Bel-Air Hotel, one-third was stored in his studio dressing room and one-third was somewhere in the new house. Only the luck of the Irish and the persistence of a proud man have saved Tyrone from appearing at the studio in a pair of house slippers, riding breeches, a dress shirt and a dressing gown. For several horrible hours one morning, while he was still a hospital bachelor, he thought that would be the only outfit he could assemble, aside from the clothing he was wearing. Once the vans had been dispatched on that beleaguered morning, Tyrone returned to the hospital. "Mrs. Power has gone to the delivery room," he was told. He was asked to take up a father's position in the adjoining room. At 11:24 on the morning of October 2, 1951, the doctor brought in, for Tyrone's scrutiny, a bright red infant with a fine head of wavy dark hair. "We have a nice little daughter for you," said the doctor. "I noticed that the first thing," said Mr. Power, trying hard not to look as chesty as a pouter pigeon. For the benefit of the birth certificate, he added that her name had been ready for her during all the long, uncertain months of her anticipation. "She's Romina Francesca Power," he said. 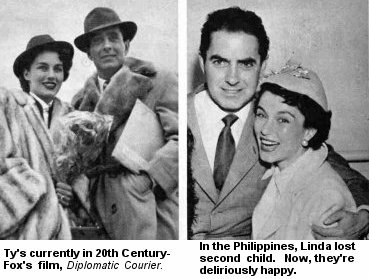 (pronounced Romeena Francheska) If she had been a boy, the name would have been Tyrone Power, IV. Romina opened her eyes, lifted an eyebrow at her pop, yawned and looked, according to her analytical parent, a little bored by it all. After making a date for future piggyback rides, Tyrone hurried to the telephone booth providently placed near the maternity wing of the hospital and telephoned Linda's mother in Mexico City. Her first question, as all mothers everywhere will understand, had to do with Linda's welfare. 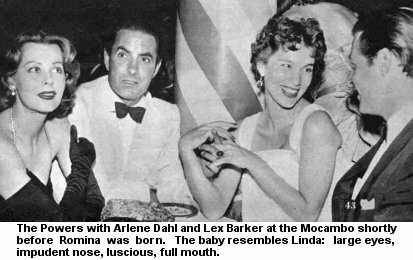 Assured that Linda was getting along rosily, she asked, "Whom does the baby look like?" Tyrone considered for several seconds. "She merely looks like a baby," he said. As he hastened back to Linda's room after finishing the call, he concluded that he had been mistaken. Romina looked like her mother; she had the same magnificent eyes and the same impudent nose, as well as a similar luscious fullness about the mouth. Romina, like Linda, was destined to be a great beauty. When Tyrone leaned over Linda's bed to smooth her hair from her forehead, she said, "You'll have to hurry to a store. We will need a baby's layette, because (a true woman, already) she hasn't a thing to wear." Tyrone took the list which had been supplied by an Advice to the Young Mother service and drove to Beverly Hills, where he delighted the sales force of one of the best shops by ordering everything exactly as tabulated. Everything, that is, from A for abdominal bands to Z for zinc ointment, not neglecting such items as bottles, both glass and rubber, blankets, a bassinet, combs, cases (pillow and diaper carryall), high chair, low chair with perforated seat, canvas swing, taylor tot, teething rings, etc. Quite a bit of the equipment had to be returned later, but at the time of purchase, all of it seemed mysteriously essential. There is a double reason why no wardrobe had been accumulated for Miss Power. 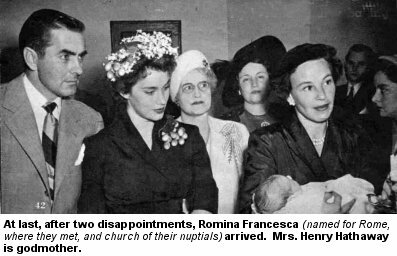 First, she was so impatient to be born that she refused to wait for her mother to attend the elaborate stork shower on a date presumed to be three safe weeks in advance of her debut. The second reason is poignant. 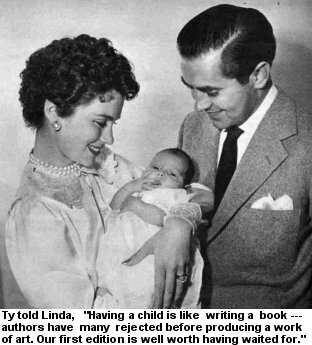 If ever two happy people wanted a family, it was Ty and Linda Power. They were overjoyed when they learned, less than a year after their marriage, that they were to become parents. Unfortunately, that dream ended in tragedy in Paris, and the ordeal nearly cost Linda her life as well. Nearly a year later, when Linda and Tyrone were in the Philippines where Tyrone was starring in An American Guerrilla in the Philippines, they lost a baby. At first, Linda's health seemed to be excellent, but as the scorching summer deepened, she became so still and white her doctor sent her north to the British Crown Colony of Hong Kong to escape the ferocious island heat. It was during this time that she bought the magnificent jade earrings, ring, and clip with which she hoped, sentimentally, to mark this joyous period of her life. She had always coveted Imperial jade, having first seen it in the world-celebrated collection at Gump's in San Francisco, but not until she reached Hong Kong and was shown some of the secret caches of the stone had she found the type and quality she wanted. Interesting fact about her being shown the treasures from which she made her selection: the merchants thought that Tyrone was going to join Linda in the resort (The shooting schedule stretched out under the heat until he was unable to do so), so they were ingratiating themselves with Mrs. Power in order to meet Tyrone. He is one of the top favorites in the Orient. In addition to the jade, Linda bought several lengths of sumptuous Chinese brocade, some of it over a century and a quarter old. She thought, "This will still be gorgeous when our baby is ready for a ball gown, if she is a girl!" When it seemed that the worst of the summer heat had abated, Linda flew back to the Philippines, only to be overwhelmed by the opening of every furnace door in the South Pacific powerhouse. There had been no equivalent heat wave in the recorded history of the area. It was more than her fragile strength could endure. For the second time, she lost a child. After she had been released from the hospital, Linda said to her husband, "I'm so despondent. Any woman can have a child. It is the first function of womankind. What is wrong with me?" Ty answered quietly, "Nothing at all. You mustn't criticize yourself. Having a child is much like writing a book: some of our best writers have had six or seven books rejected, but eventually they produced a work of art. When we finally acquire our first edition, she will be well worth having waited for." It was a comforting view to hold at that time, and the advent of Romina Francesca proved conclusively that Tyrone's philosophy had been right. An added happiness is the doctor's prediction that from now on, Linda will have no difficulty in giving Romina several little brothers and sisters.